What really is Pardot? We have all undoubtedly heard about how great it could be for sales people, but is that as far as this powerful tool can take Salesforce users? Of course not. Pardot is a perfect tool to include as part of your Higher Ed Salesforce implementation. Pardot is B2B marketing automation solution that ultimately makes the jobs of sales and recruiting teams much easier. We have seen more and more Higher Ed Salesforce implementations including Pardot for their recruiting teams and it’s obvious why once you begin using it. The features in Pardot provide a seamless connection between your marketing campaigns and how your recruiters can interact with prospects. Pardot allows you to track prospects, conversions, and marketing campaign activity from a single dashboard. It also allows you to create email marketing campaigns to generate leads and then measure the success of those campaigns. These campaigns are highly customizable so when prospects receive the email content, it looks and feels like your brand. Part of this customization allows the leads to go down a customized marketing content campaign based on their actions when receiving the emails. For example, If the lead opens the first email and doesn’t respond then they will receive a different email for the second stage in the campaign than if they decided to not open it at all. Perhaps most importantly for your recruiting team is the real-time feedback on actions that leads take. For example, if someone registers for a webinar and fills out one of your forms, you get an alert for that action. Leads and prospects are also assigned a score and organized in order based on their interactions with marketing campaigns. That means that if a client signs up for a webinar and visits the website several times then they are really thinking about your school. This information about client action enables recruiters to focus on the highest priority recruits right now. Pardot also enables recruiters to put these prioritized prospects into a “Nurturing Program” that gives them a more personalized follow-up campaign from whoever owns the lead. The “Nurturing Programs” within Pardot essentially automate the personal follow-up process for your recruiters. So, if a prospect says they just can’t devote the time for a conversation for about a month, then we can put them on a 30-day Nurturing Program that is going to follow-up for you at pre-determined intervals and with pre-determined messages so you don’t have to think about any prospects that are not needing attention today. Pardot is the answer to many problems in the recruiting world. It automates a lot of follow-up that lingers in the back of our minds, allows customized marketing based on actions the prospect takes in the marketing campaign, and provides a seamless connection between the marketing team and the recruiting team. Pardot may be an important consideration when thinking through your Higher Ed Salesforce implementation. If it starts to feel like too much work on top of everything else that needs to be implemented then finding a Salesforce Partner company to assist with implementation may be a great next step. Posted in Salesforce, Salesforce Challenges, Salesforce cloud Implementation, salesforce consultant, salesforce customization. Tagged with Higher Ed Salesforce Implementation, Salesforce Implementation, Salesforce Integration. 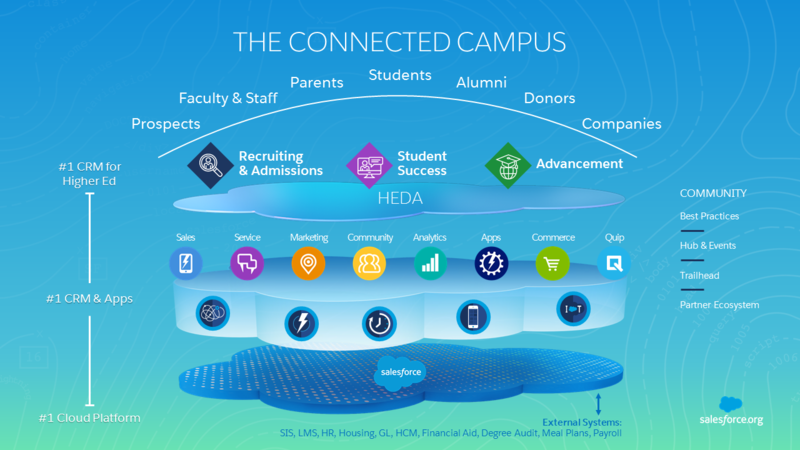 HEDA (Higher Ed Data Architecture) is a cornerstone for enabling Higher Ed Salesforce Implementation for universities and campuses. However, Salesforce.org officials and training webinars have explicitly said that it is a stepping stone for organizations, not an all-encompassing solution. Salesforce.org training materials suggest that if Higher Ed institutions intend to expand the presence of Salesforce in their organization in the future, then they may benefit from consulting with a Salesforce Partner company that specializes in Higher Ed Salesforce Implementation. HEDA has made Salesforce so much more than just a sales CRM. With that said, it does not solve admission, advising, communication, alumni relations, or fundraising. It does, give you a basic, light-weight, platform that you then can take and build on to create specific solutions to areas that are important to your specific organization. Some universities need more attention in one area over the other, and HEDA allows for that customization. But with customization comes complexity. We like out of the box solutions because they are easy and simple. HEDA provides an out of the box beginning to what could make you feel like you are boiling the ocean. Posted in Salesforce cloud Implementation. Tagged with HEDA, Higher Ed Salesforce Implementation, Salesforce Implementation.